What happens to the liberal arts and science education when universities attempt to sell it as a form of job training? In Lowering Higher Education, a follow-up to their provocative 2007 book Ivory Tower Blues, James E. Cote and Anton L. Allahar explore the subverted 'idea of the university' and the forces that have set adrift the mission of these institutions. 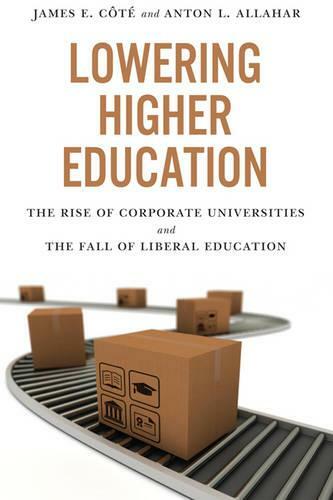 Cote and Allahar connect the corporatization of universities to a range of contentious issues within higher education, from lowered standards and inflated grades to the overall decline of Humanities, Social Sciences, and Natural Sciences instruction. Lowering Higher Education points to a fundamental disconnect between policymakers, who may rarely set foot in contemporary classrooms, and the teachers who must implement their educational policies-which the authors argue are poorly informed-on a daily basis. Cote and Allahar expose stakeholder misconceptions surrounding the current culture of academic disengagement and supposed power of new technologies to motivate students. While outlining what makes the status quo dysfunctional, Lowering Higher Education also offers recommendations that have the potential to reinvigorate liberal education.